This compote is very simple to make. It's a quick dessert to make and oh so delicious! Start by cutting the brambley apples ( about 1 per person) into cubes. In a frying pan, melt a knob of butter then add the apples. Cover the apples with vanilla sugar* (about 4 tbl spoons). Add a zest of orange and a sprinkle of cinnamon and grated fresh ginger. Let the apples cook in the sugar always stirring. It takes about 5 to 7 minutes to cook. 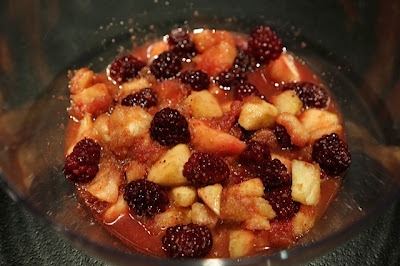 Once the apples are done, add the blackberies and take off the hit - the blackberries cook with the hit from the apples. And your dessert is ready! Serve it with ice cream or greek yogurt!